Fiona Winning is one of the 4 artists were selected via open call to work with Eastville Project Space between November 2015 and May 2016. Each artist will be based in Eastville between 1 week to a month to research and develop artistic projects that focus on connecting to the neighbourhood community and support to create a unique art programme for Yeovil and its surrounding area and beyond in the near future. 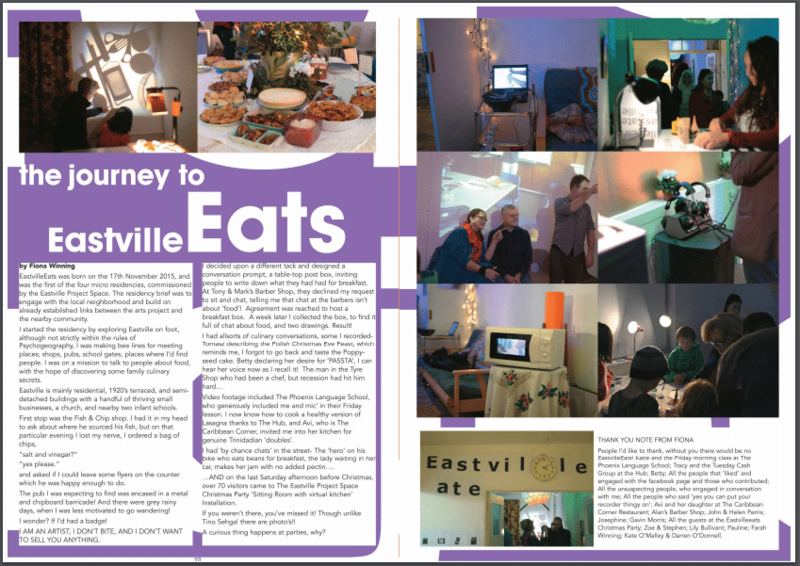 During her stay in Eastville she will invite people living and working in Eastville and in Yeovil to share their ‘treasured’ family culinary secrets, prepare them and share them. A celebration event will take place on 19th December (4-7pm) to invite the public to join the artist and participants to share the tasty ‘gifts’ of generosity. The project will be recorded using video, audio, including mono-prints made by participants, which will add to the cultural and historical memory and identity for Eastville. Sharing your secret recipe with us? Part of the project, we would like to collect and share your favourite recipe. If you like to take part and find out more, please go to the following link and enter your entry.